A few years ago I read reports on superior accuracy of CZ guns, and bough several of them as my first rimfire rifles. 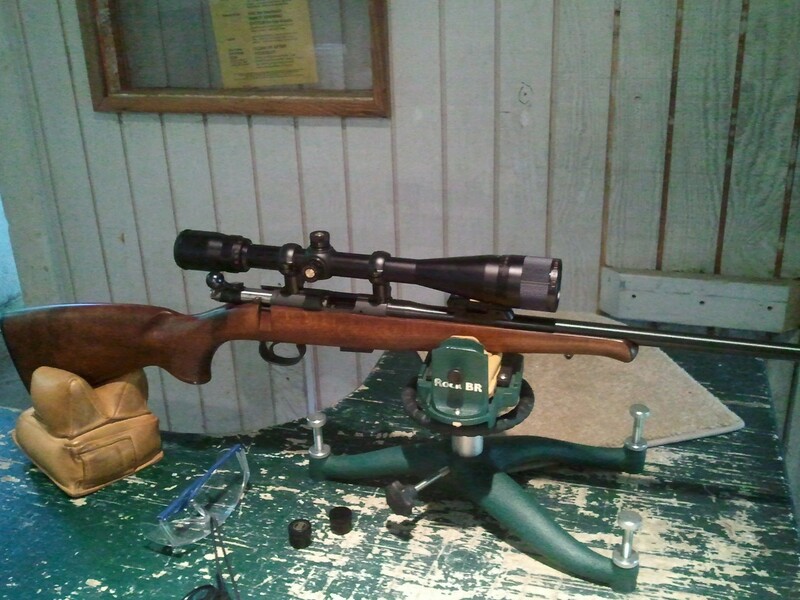 The UltraLux was first, then Military Trainer, then one more Military Trainer in 17HMR. The reviewers everywhere were praising the design: receivers milled from steel billet, high quality military style open sights, beautiful stocks. The quality of their build was visibly a couple of steps above their price range, so the moniker "Czech Anschutz" fit well. CZ have discontinued the 452 line, but we still have a bunch of them at our store! I shot my CZs for a while. They were accurate - much more so than any Ruger 10/22 that I've seen on the range, even the ones upgraded for "match" configurations. With the price of 22LR ammunition being low, and reloading impossible, I was able to shoot very large volume with modest investments of both time and money. Eventually, however, I switched from sporting guns to proper match rifles. Because CZ 452 did not do so well with the mid-range match ammunition (Wolf Match Target) that I used the most, I branded it a "plinker" and relegated it to the back of the safe. But when I've heard that they were about to be discontinued in favor of a more versatile but less accurate CZ 455, I bought more for my personal collection. And lately I was lucky - after a 6 months wait - to get a few more for Precise Shooter stock (http://www.preciseshooter.com/Products/CZ452.aspx). This, and an earlier acquisition of Lapua 22lr ammunition (http://www.preciseshooter.com/AmmunitionHome.aspx) made me wonder how CZ 452 would perform with proper high grade match ammunition. 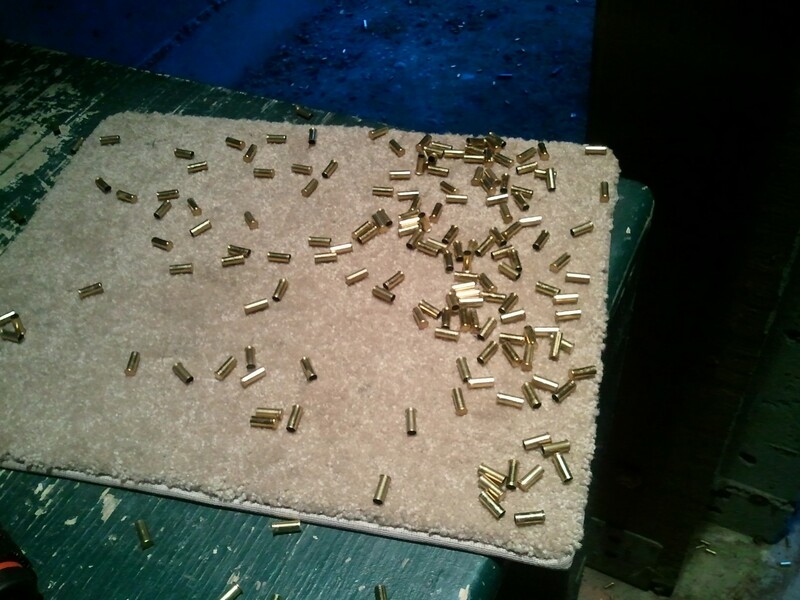 So last Sunday I collected every type of high quality 22LR ammo that I had and headed to the range. 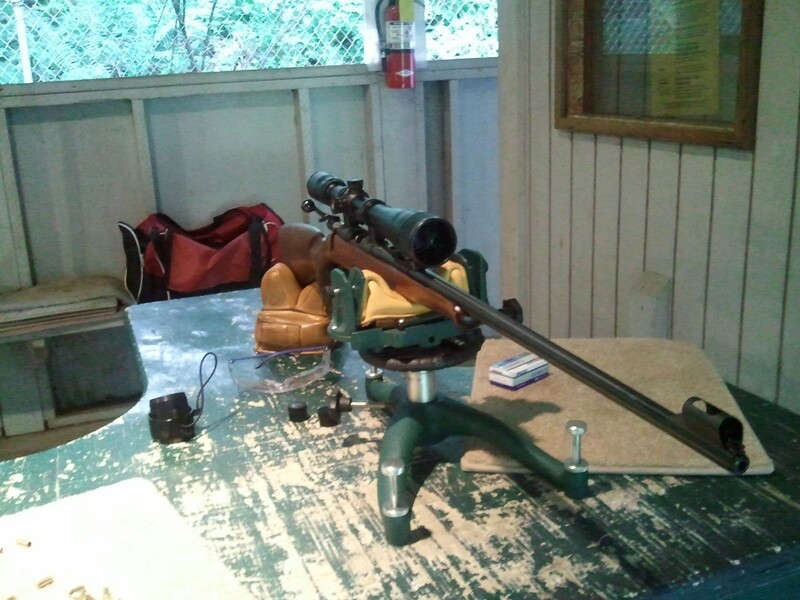 The scope that was used was an inexpensive, but excellent Bushnell Banner 6-24 scope with 44mm objective. I bought it on Amazon, refurbished, for only around $100 (it looks like price went up significantly since then), and it was brand new for the experiment. The Korean-made scope had a clear picture and tracked very well. I use only Burris Signature Zee Rings these days (http://www.preciseshooter.com/Products/BurrisSignatureZee.aspx), so the scope was mounted in rimfire version with 20MOA inserts, ensuring that at 100 yards the scope was at around middle of its adjustment range. I mounted it at home and boresighted with a laser boresighter, so when I brought the rifle to the range the point of impact was only 3 inches low and 2 inches to the right. I used Caldwell's Rock BR for the shooting rest, and Protektor front and rear bags (http://www.preciseshooter.com/BenchrestHome.aspx). The rifle itself was stock with a single-shot adapter and YoDave trigger kit which lightened the trigger pull to about 8oz. The shooting distance was 100 yards. 385 rounds of high-grade match ammunition was fired at 72 1" targets, mostly in 5 round groups. ...were much better than I expected! Although in centerfire cartridges Wolf is often considered to be a cheap brand, its 22lr ammunition is well respected and is widely used by competition shooters. Its relatively low cost makes it popular, especially for training. Wolf rimfire ammunition is made in Germany and comes in two flavors - Match Target and Match Extra. Although I do not have personal experience with Match Extra, multiple reviews on the Internet suggest that there is very little, if any, difference between the two, even though Match Extra costs more. Wolf Match Target usually costs between $50 and $60 per brick of 500. Although my Kimber loves it, in CZ 452, Wolf MT produced a bunch of unimpressive groups. The average group size was 1.63". 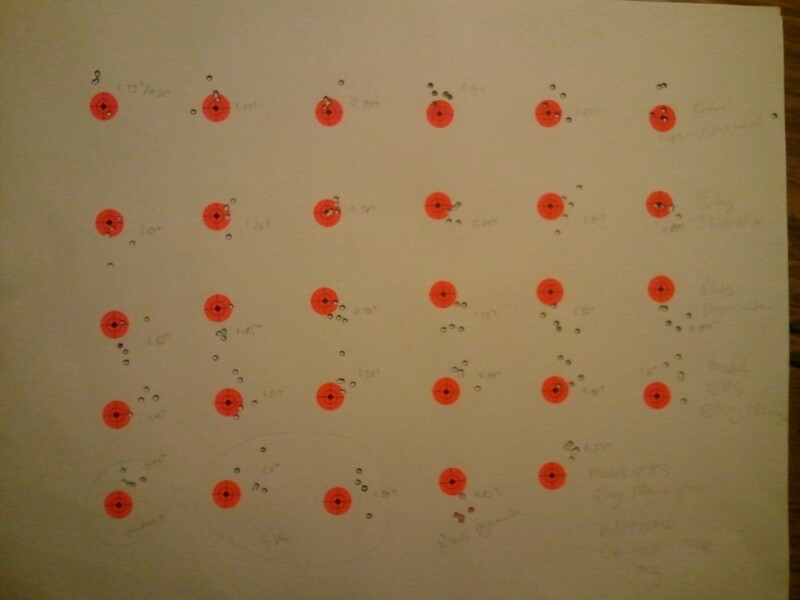 I also shot one 15-shot group that measured 2.8", or 1.9" with one outlier removed. Lapua Midas+ is considered to be one of the top competition-worthy ammunition brands. At roughly $180 per brick of 500 it is relatively pricey. The results with it were much, much better. The average group here was just below 1". Furthermore, Lapua ammo came from two batches - the first 5 groups was a box that I had for a while, whereas the next 6 are from the current shipment. The average group for the new batch is only 0.87". On to Lapua X-ACT. This is insanely expensive ammunition with price that is dangerously close to match centerfire rounds ($270+ per brick), and it showed on paper. It produced 3 of the best groups of the day. Polar Biathlon is one step below Midas+ in price ($150/brick). However, the average group was almost the same. 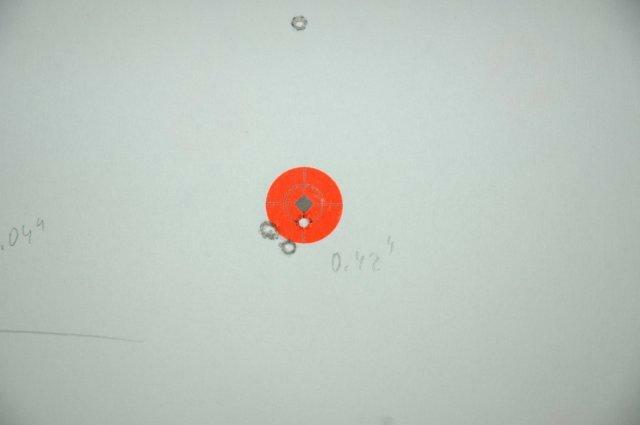 It also produced a very neat 0.94" 10-shot group. 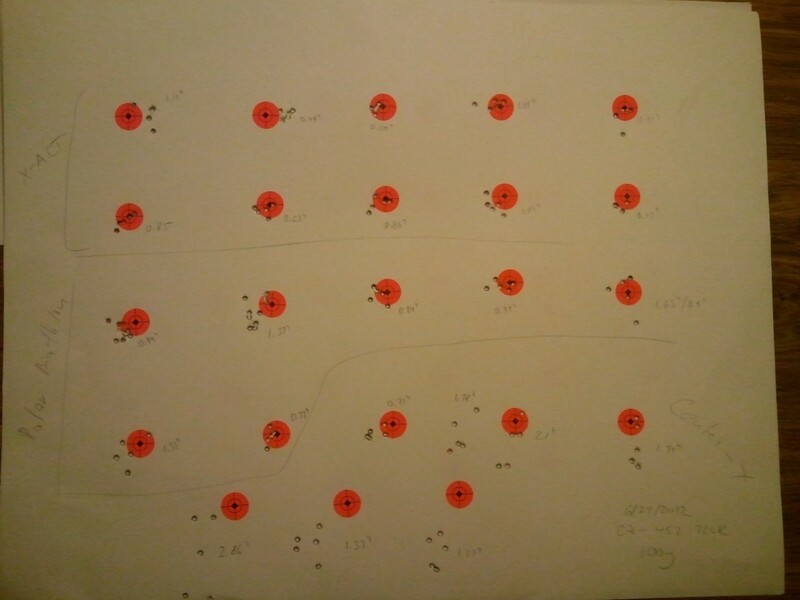 The two 10-shot group would normalize to 2 0.77" and 2 1.12" groups (see here for the mathematics of this conversion: http://www.preciseshooter.com/blog/WhatIsAnAccurateRifle.aspx), so the average works out to be 1.02". This is the cheapest Lapua brand. The rifle really, really did not like it! Averaging this is pointless :-(. 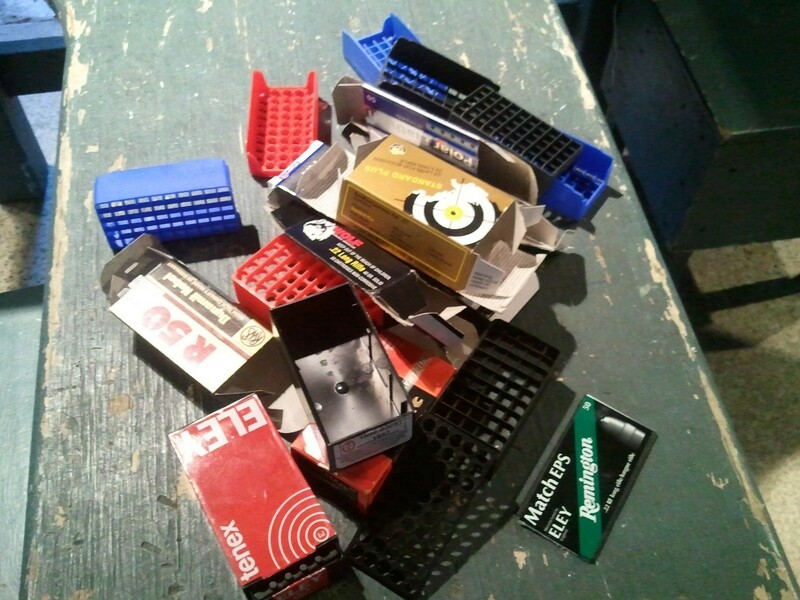 With Lapua gone now, I had a bunch of opened boxes of other match ammunition, so I shot these. This is the best Federal rimfire brand. It is relatively expensive ($150-ish per brick), and it shot reasonably well, but not as well as Lapua. Here the average group is 1.15". Eley Tenex is one of the most expensive rimfire brands ($200/brick). My Kimber really loves it. On CZ it shot OK, but just OK.
Another medium priced ($150/brick) match round, it shot worse than the rest in its class. Another example of medium priced ammunition that shot reasonably well compared to the competition. 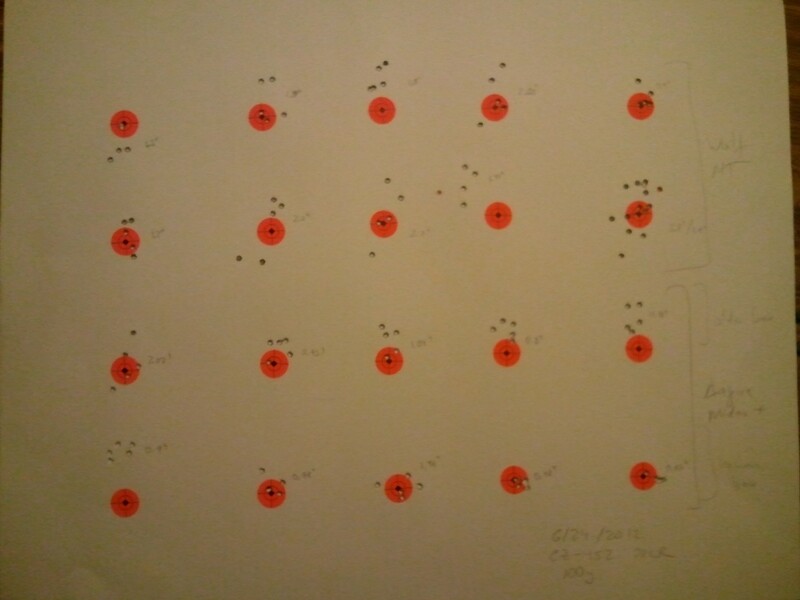 For a 22LR sporting gun, this was very good performance. 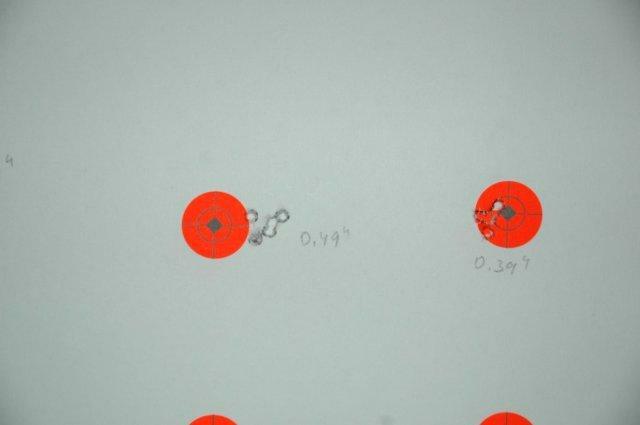 100 yards is essentially the outer edge of the accuracy for Long Rifle ammunition, so holding sub-inch groups for some ammunition types, and just over one inch groups for others at this distance is not bad at all. While the benchrest 22s should be expected to do better, as does my Kimber (http://www.preciseshooter.com/blog/Kimber82G.aspx), they are not as portable, nor as easy to shoot where bench rest is not available, and thus might result in worse perfomance in field conditions. Every shooter should have CZ 452 in his or her collection, and I wish CZ would reconsider their plans to phase this gun out of production.